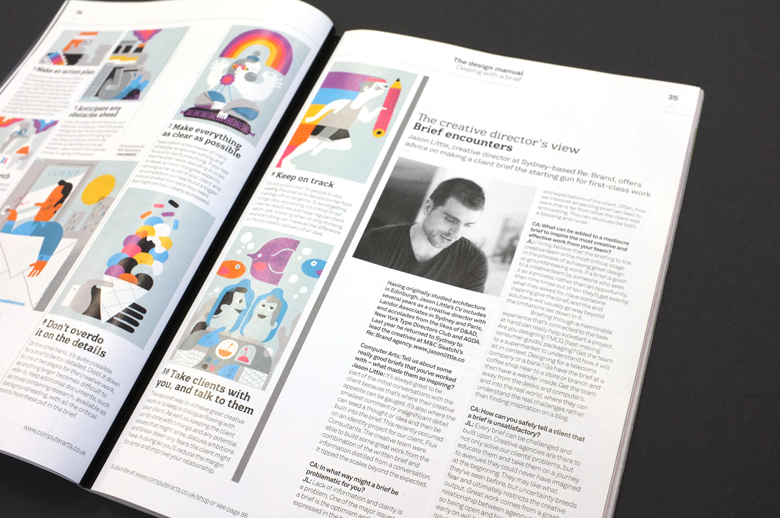 Our creative director Jason Little is featured in April's edition of Computer Arts magazine discussing how important a good brief is to creating game-changing design. His interview highlights the need for good writing, research, strategy and even the enthusiasm of delivery "Have someone inspiring give the brief, and the end solutions will usually go way beyond the limitations set down in it." Computer Arts: Tell us about some really good briefs that you've worked with - what made them so inspiring? Jason Little:It's always great to be part of the initial conversations with the client because that's where their creative appetite can be gauged. It's also where the smallest comment or insignificant detail can seed a thought or idea and then be built into the brief. This recently occurred on an identity project for our client, Flux consultants. The creativeteam were able to build some great work from the combination of the written brief and information distilled from a conversation. It tipped the scales beyond the expected. CA: In what way might a brief be problematic for you? JL: Lack of information and clarity is a problem. One of the major issues with a brief is the optimism and appetite expressed in the brief versus the reality and expectations of the client. Often, how we interpret an exciting brief can lead to work that is far from what the client was anticipating. This can obviously be both a blessing and curse. CA: What can be added to a mediocre brief to inspire the most creative and effective work from your team? JL: I firmly believe that the briefing to the creative team is the most critical stage in the process of achieving great design or ground breaking work. If a brief is given to a creative team by someone who sees it as a process, rather than an opportunity, then nine times out often they'll get exactly what they asked for. Have someone inspiring give the brief, and the end solutions will usually go way beyond the limitations set down in it. Briefing through a memorable experience that's connected to the task at hand can really help kickstart a project. Are you designing FMCG [fast-moving consumer goods] packaging? Get the team to a supermarket to understand how it wiII sit in context. Designing for a telecoms company or a bank? Go have the brief at a coffee shop near to a store or branch and then havea wander inside. Get the team away from the desks and computers, and into the real world, where they can understand the real challenges rather than finding inspiration on a blog. CA: How can you safely tell a client that a brief is unsatisfactory? JL: Every brief can be challenged and built upon. Creative agencies are there to not only solve our clients' problems, but educate them and take them on ajourney to avenues they could never have imagined at the beginning. They may like what they've seen before, but uncertainty breeds fear and ultimately restricts the creative output. Great work comes from a great relationship between agency and client, so being open and honest about any issues early on will help prevent some major issues later when it's all a little too late. 1. Does the brief fit your abilities? Receiving a new brief can be exciting, confusing or even worrying. Evaluatingit to see if it fits with your organisation’s skills or desires is key to determining whether you take the piece of work on, or let it pass to another. Understanding the implications early on is critical to financial and creative success, for both the clinet and yourself. Sit down and discuss the brief. What is the challenge and scope? Is the client new or ongoing? What does the client usually need? What are the long-term goals? Does the brief offer the chance to gain experience in a new sector? Is it a rebranding? Is it a refresh or is it simply something executional? Understand what you’re getting into, and then think about how to take the conversation further. With most briefs of a reasonable size and scope, you'll need exercises such as client Q&A sessions, stakeholder workshops, desk research and internal interviews to understand the many levels of information and complexity behind the brief. From this research, you can then make strategic recommendations that will form the foundation of the creative process. Extra information that will help you work effectively includes your client's business strategy and top line, plus any potential roadblocks to watch out for along the way. Make sure that you smooth the workflow by identifying who the key decision-makers are and their intended. A reverse brief from afreelancer, stupio or agency back to the client can often help clarify things on a larger project. It not only demonstrates to the client that you've understood the brief or opportu nlty through the lens of your own insights, but that you dIn build greater depth and breadth into the brief. Assumption is the master of manyproblems, so assume nothing and be sure to darify everything. If youfeel that the brief needs decoding in order to reveal its more intangible aspects, carrying out an audit of your client and its competitors can help build a bigger picture of what the client may need, but might not have clearly expressed. On the other hand, it's quite possible for a brief to be too detailed . Distil it down to one or two pages for the creative work, as anything longer becomes difficult to refer to. Keep additional documents, such as those containing research, available as background reading, with all the critical points from these put in the brief. It's not uncommon for people to skip reading the brief, or to deviate too far from it and go off on tangents. To avoid getting things very, very wrong, it's critical to set internal deadlines and have regular client catch-Ups. Knowing when to stop thinking and start doing can make all the difference to the successful delivery of an idea. The easiest way to achieve great creative work is to keep a dialogue flowing with your client. As well as keeping the client up-to-date with timings and any potential issues that might arise, discuss ambitions and break down any fears the client might have. Indoing so you'll reduce the margin for error and improve your relationship.